A few weeks ago, Flipboard (often referenced to as the iPad killer app”) was finally launched for the iPhone. And what the developers did to transport the flowing way of navigating your streams and news sources to the much smaller screen of the iPhone is more than convincing. Flipboard has very quickly become my favorite app for reading Twitter, Facebook or Instagram. There are two different varieties of personalization. The “old” variety that surfaced with the first dynamic web pages based on CGI scripts, allowed the user to select from a number of options defined by the editor (or webmaster). This variety is based on the notion of more or less homogeneous audiences or large groups of people. In this world you could chose between European, North-American or Asian news sources the same way you could chose between Tech, Culture or Politics channels. But you could not create, edit or share these streams. The “new” variety of personalization allows to do exactly that. You can not only chose your streams but create, edit and share your streams. In Flipboard the most convenient way to do this is via Twitter lists. You only have to create a Twitter list of people or sources (= bots) that reflect your information needs the best, add this list to your Flipboard and off you go with your personalized news ecosystem in the “new” variety. You can also share your news list by making the list public. This way you can not only curate content, but also curate interesting people. Another option is to curate your own Flipboard channel via a Twitter account, Facebook account or a generic RSS source such as a blog. I believe that there will be many applications resembling Flipboard in the future, so that sooner or later it will make sense for media companies to have a “Flipboard curator” that knows how to write optimized for this kind of aggregators. Since this morning more than 1.5 million status updates have been posted through the feed (there were 200,000 b 8:30 am PST). During the broadcast an average of 4,000 status updates were written every minute, and 8,500 were written every minute during Obama’s speech. We saw 5x normal tweets-per-second and about 4x tweets-per-minute as this chart illustrates. But how much is 5x normal or 4x normal? Mashable wrote: “Tweets containing “Obama” hit 35,000 per hour during his speech.” This would be 583 Obama tweets per minute. Not too much. My method: Fortunately every tweet has its own id which is simply increased by 1 with every new tweet. So to calculate the average Twitter speed during Obama’s inauguration, I looked for the first Obama tweet that had been posted at 12:00 and the first tweet at 1:00. The difference between those two is the number of tweets published during this hour. The result: During 12pm and 1am, there had been 4746 tweets per minute (TPM). 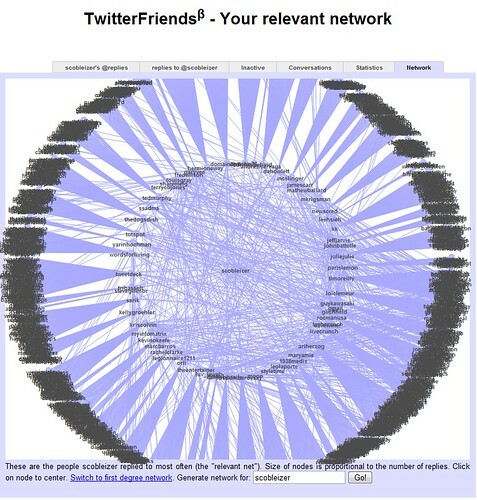 One of the new features of TwitterFriends is a visualization of your incoming and outgoing networks. Remember: Your incoming network includes all Twitter users that replied or referred to you on Twitter the last 30 days at least twice. And the outgoing network – your relevant net – includes all Twitter users you referred or replied at least twice. You can see this new diagram on your stats page: http://twitter-friends.com/?user=kevinrose. Just replace kevinrose with your Twitter username. No password required. Popularity: The network of people addressing him is much larger than the network of people he’s addressing. It’s almost eight times larger (see number in the left box of the statistics page). This measure goes in the same direction as the Friend-to-Follower-Ratio. If a lot of people are sending you replies and you are only able to reply to a small fraction of them, you’re popular. So, the different sizes of the two networks are a measure for popularity. Overlap: The overlap is not too large. In fact it’s only 28.6% (see number in the left box of the statistics page). There are many people trying to talk to Kevin Rose on Twitter that are not receiving replies. But on the other hands there are Twitter users, Kevin Rose talks to that do not answer his replies regularly or their accounts are protected – TwitterFriends does not analyze protected data, even if you log in with your Twitter credentials at the top of the page. Friends: If you want to know more about the people in the overlapping area, take a look at the full user cloud either incoming or outgoing. Those names with a bidirectional arrow are contacts that are talking to Kevin Rose on a more or less regular basis and receiving Twitter messages by Kevin Rose as well. Of course, these users are not always what we’d are calling “friends” in real life, but they are regular conversation partners. Now you can take a look at your own TwitterFriends statistics and compare your Venn diagram with the above. Are your networks more overlapping? Do you have a larger incoming than outgoing conversational network as well? If you experience a bug or have a great idea about how to improve TwitterFriends, send me a Twitter message to @furukama or just submit your input to the TwitterFriends support forum. How efficient is your Twitter network? Valdis Krebs just wrote a great blog post about his strategy of maximizing his Twitter network efficiency. We all know, the more people you are following on Twitter, the more difficult it gets to keep in touch with all of them. Most often you are reducing your network size by selectively reading about and replying to the people you really care about (the relevant net) or the people you are talking to you (reciprocity). The trick is to find the people that reach many social circles and follow them. Of course, we need to find more than the minimum of people to follow — you want some redundancy in your network so that there are multiple paths to places of interest for you. After looking at some other Twitter users’ networks, @valdiskrebs’ network efficiency of 95.01% still ranks among the highest values. So, his strategy of building a diverse network that allows for information from different sources to reach him, seems to be quite successful. To find out your Twitter Network Efficiency, visit this site: http://twitter-friends.com/?user=furukama&mode=net and replace the username with your Twitter username. Maybe the value will seem high at the beginning, but this can be because not all your friends’ connections are in the TwitterFriends database yet. Click on the names below the graphic to load them. Note: For some users the network may initially appear quite empty because the network data of their contacts are not yet cached. In this case, there will be a list of links below the network graph. By clicking on them you can collect the missing data. Users with private profiles or who have not used @replies can not be included. You do not need to enter your Twitter credentials to visualize your network. Comments and bug reports via Twitter to @furukama or in the comments. Thank you! I’ve already mentioned the paper by Bernardo A. Huberman, Daniel M. Romero and Fang Wu about Twitter’s social networks (pdf). The point that interested me most was the distinction between contacts and friends. Especially for people with a liberal following policy (i.e. that follow back once someone follows them on Twitter), their network of contacts is not very meaningful. But what is a meaningful network on Twitter? Huberman, Romero and Wu propose that there is a hidden network of friends that you just have to extract from your overall contact network. This hidden network is transaction-based: it’s the people you have replied to using the @syntax more than once. Because it is based on the choices you made, I’d prefer to call it the “relevant net” because it works similar to the “relevant set” known from marketing. This network consists of the few people from your total network that you find meaningful enough to actively address them. My relevant net consists of 92 nodes. In my last 1,000 tweets, I addressed only 92 of my 1,400 contacts (6.6%) more than twice. But the replies are not equally distributed. There are many people I only addressed twice and there are some people I talked to very often. The above visualization shows the different layers of my relevant net. In the middle is the “inner circle” of my Twitter friends: a small number of people I addressed very often. The colors are important: blue are people I met in real life, orange are people I have not (yet) met and gray are bots or organizations. My inner circle is blue. This means that the people I talk to most often on Twitter are people I also know and talk to in real life. Although this conversational network is not as dense as the network resulting from the following/followers network, it is not, as you would expect from what Huberman, Romero and Wu are writing, exactly a sparse network. Its density is 6,06%. This means, that of all 8,372 potential directed connections, 507 are realized. 8 nodes have received no replies at all. Without them, density would be 7,45%. Often, for directed valued graphs like this one (= graphs differentiating between incoming and outgoing ties) density is calculated as the average of the line weights (= number of replies between two persons). In this case, the density is 39. This means: the average number of replies from one of my Twitter friends to another is 39. The distribution of the incoming @replies in my network looks like a power distribution, which means that this network should be a scale-free network. Few people in my network receive a large number of replies while a large number receives only few replies. Social Media Measurement definitely should take a closer look at social network analysis. If you want to find out who are the influencers in a network like Twitter, looking at the numbers of followers could be misleading. @having has a large number of followers and is one of the nodes in my relevant net that gets the most replies. Is it an influencer? No, it isn’t. It doesn’t talk back. Twitter should find a method allowing us to keep closer in touch with our relevant net. This small subset of all my contacts is often what’s interesting me the most. I’d love to have a tool that keeps me updated on them. But I don’t want to select my relevant net manually as it is possible with Twitbin-Groups. Above I’ve described a way, this can be done automatically. This is a good example for the importance of relevance instead of total reach (e.g. number of followers, visitors, clicks) in social media. The actual exchance of messages, the dialogue that’s happening on Twitter is taking place in such relevant nets. Phenomena like these deserve much more attention by social media marketeers. If you want to know your relevant net, you can calculate your Twitter friends with this application. The Network: simply the network of your followers / followings. Those are the people whose updates you might be reading and who might be receiving your updates. This is the reach of your Twitter stream. The FOAF-Network: the network of your followers’ / followings’ networks. Those are the people you could potentially reach via retweeting messages. This is the extended reach of your Twitter stream. The @-Crowd (or the “hidden network”): the people you are talking / replying to. This is the most interesting measure, because it’s the people you are explicitely addressing. The authors of the paper call contacts you have addressed (or replied to) at least twice “friends”. So, let’s take a closer look at the people I am talking to on Twitter (= my @-Crowd) with a small tool I just wrote. It only shows Twitter users I sent at least 2 replies – i.e. “friends” in the terminology of Huberman, Romero and Wu. You can see from this analysis of my latest 400 tweets that I’m using the @-syntax more often than the average Twitter user (25,4%). A larger part of my twitter messages actually is a dialogue with a small number of people. In my last 1,000 tweets, for example, I did only reply to 6% of my total Twitter contacts more than once. If you take a look at different users (just replace the user=username with your Twitter username), you see that there are different patterns of Twitter usage. Some talk with very many different people, some use the @-syntax only in a few replies and some are using Twitter as a dialogue tool. Peter Kim has a long list with over 300 brands’ social media efforts. Then there are many case studies if you take a look at this category in Jeremiah Owyang’s blog. Geoff Livingston has a selection of cases on his blog. I collected German cases of social media marketing on my German language blog. And now I’ve learned that Peter Kim and his community will publish the cases in “A Wiki of Social Media Marketing Examples“. Great idea! I will enter my cases when I have received my account for editing the wiki. Anyway, what is still missing are numbers. There is a very lively debate on social media measurement (measuring influence, engagement, ROI etc.) going on – but there are no numbers, not even estimates in these lists at all. In my opinion, this lack of numerical evidence is what’s holding German companies back from spending more money for social media marketing. The BBS – big budget shift – will have to wait until we can offer the marketing executives a convincing story about which numbers for reach, engagement, performance they can expect in social media marketing. They know their numerical environment very well when it comes to TV or newspaper ads but this is not the case with social media. They have to be able to tell whether 5.000 installed widgets on Facebook are a success story or failure. 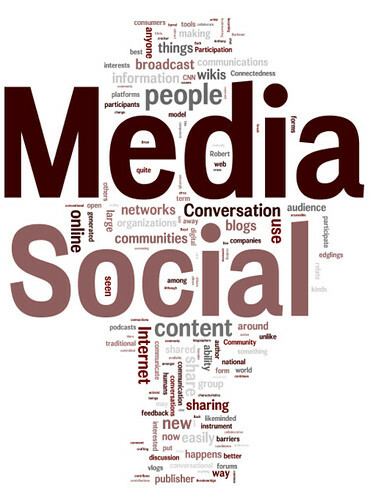 An important step will be international standards for measuring the different facets of social media. To encourage debate about definitions, standards and best practices, the German Social Media Association will host a “Social Media Measurement Summit” on 27 January 2009 in Munich, Germany. I’m looking forward to discussing these matters with you all in Munich! Global web? Sounds like redundancy, but in fact many phenomena on the world wide web aren’t so global at all. Although non-western languages are of rising importance online, English still is the most spoken language on the web. And so it should be clear that Barack Obama’s election is mostly an American or perhaps Western affair. Is this a language issue – Obama perhaps being a very common name or word in those countries – or is this really a sign for the emergence of a more globalized internet? Is it about Obama or obama? There is some evidence for the second explanation: 1) the search volume clearly peaks on 5 November, the day after the election, 2) the three top related searches are for “barack obama”, “obama mccain” and “mccain”, 3) none of the mentioned countries were in the top list in 2005. So, are we really witnessing the beginning of a truly global internet or a worldwide discursive space? Manuel Castells spoke of the emergence of global networks in production, communication, consummation and power, but also of locales or regions that are virtually cut off from this network. Maybe Africa is not so unlinked anymore? luke wrote: The Hot and cool scale was supposed to be just that, a sliding sc ... On Is Twitter hot or cool? Rob wrote: I'm kind of curious myself. I have a twitter toolbar for firefox ... On 3.5-4.5 mio Twitter users worldwide?